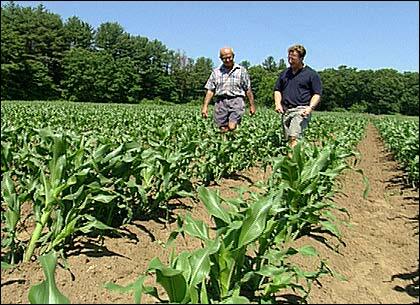 Michael Weishan lent an ear to Steve Verrill of Verrill Farms in Concord, Massachusetts, who shared some expert tips on taking care of your corn. Plump, sweet corn is one of the culinary delights of summer  especially when it's fresh from a local farm, or better yet, your own garden. As late summer approaches, and with it harvest time, a few pests and problems may need overcoming before you gather in your cornucopia of corn. Raccoons like corn just before harvest time, sometimes ripping the ear completely off the stalk. To begin with, there are weeds, although they're hardly a surprise. As a farmer, Steve can hardly handpick each and every unwanted root, so he uses a combination of mild herbicide and mechanical methods to combat his weeds. But what of other, peskier pests? The corn earworm is certainly the bane of many a corn grower. At night these pests (in moth form) alight in the corn silks where they lay their eggs, and the larvae soon hatch to feed on the kernels at the top of the ear. Luckily for the small-scale home gardener Steve has a good organic method you can use to control the earworm: mineral oil. All you need is a spray bottle. Right around the time your corn is reaching maturity  when the silk begins to turn brown  spray the ears of corn with a dose of mineral oil. That will coat any eggs that may be infesting the silk, preventing them from hatching successfully and getting to your corn before you do. 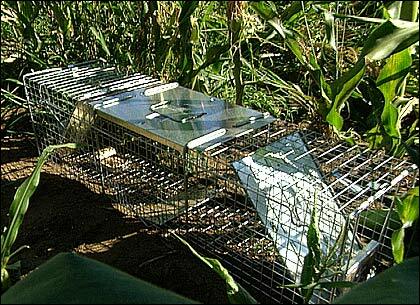 Humane traps are available for capturing the ravenous raccoons without harming them. Around the same time you may also discover your corn is being visited by a couple of other intrepid intruders, namely, raccoons and birds. 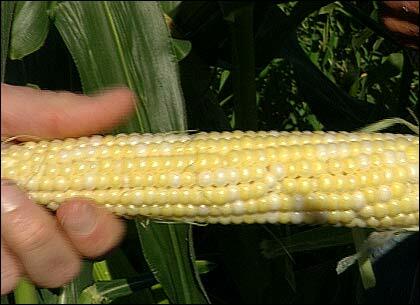 Your corn is ready to harvest when the kernels at the silk-end of the ear are as well developed as the ones around the middle. Blackbirds and crows can pose yet another  and since they tend to descend in groups, potentially more costly  threat to a crop of corn. Their general practice is to shred the ears from the top down, often only eating a few kernels, but nonetheless leaving the ear publicly unsaleable, if not privately inedible. That in mind, it's easy to imagine how as few as a dozen or so birds, spoiling an ear or two each, can wreak fast havoc on your backyard stand of corn. To fend off this nuisance at Verrill Farms, Steve uses a propane-powered noise cannon. For more domestic purposes, there are a range of lighter-duty products on the market, from ultrasonic devices, to motion-activated water sprayers, to various whirligigs and visual "scarers." It's tough to verify the relative effectiveness of these products, however, so if birds are presenting a problem to your corn crop, we recommend experimenting with a few different techniques, and seeking the advice of an experienced local gardener. 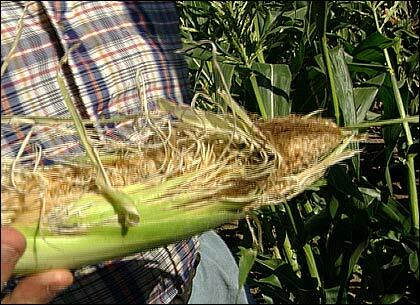 Pests aside, another frequent corn query is: How do you know when to harvest? Well, if you can't or don't want to use Steve's "raccoon method," then it comes down to a matter of corn-grower's touch, which gets better with practice. The key is to feel around the silk-end of the ear; what you're feeling for is that the kernels at the end are as large and well-formed as the ones around the middle of the ear. If not quite, your corn is still a day or two premature; but if so, that means you're ready to harvest. Happy crunching! This segment appears in show #2716.